Usually performed by a gynecologist. Hysterectomy may be total (removing the body, fundus, and cervix of the uterus; often called "complete") or partial (removal of the uterine body while leaving the cervix intact; also called "supracervical"). 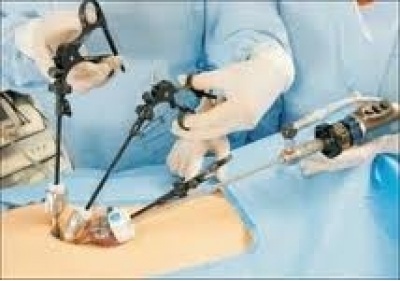 It is the most commonly performed gynecological surgical procedure. In 2003, over 600,000 hysterectomies were performed in the United States alone, of which over 90% were performed for benign conditions. Such rates being highest in the industrialized world has led to the major controversy that hysterectomies are being largely performed for unwarranted and unnecessary reasons. Most hysterectomies in the United States are done via laparotomy (abdominal incision, not to be confused with laparoscopy). A transverse (Pfannenstiel) incision is made through the abdominal wall, usually above the pubic bone, as close to the upper hair line of the individual's lower pelvisas possible, similar to the incision made for a caesarean section. This technique allows doctors the greatest access to the reproductive structures and is normally done for removal of the entire reproductive complex. The recovery time for an open hysterectomy is 4–6 weeks and sometimes longer due to the need to cut through the abdominal wall. Historically, the biggest problem with this technique were infections, but infection rates are well-controlled and not a major concern in modern medical practice. An open hysterectomy provides the most effective way to explore the abdominal cavity and perform complicated surgeries. Before the refinement of the vaginal and laparoscopic vaginal techniques it was also the only possibility to achieve subtotal hysterectomy, meanwhile vaginal route is the preferable technique in most circumstances. Vaginal hysterectomy is performed entirely through the vaginal canal and has clear advantages over abdominal surgery such as fewer complications, shorter hospital stays and shorter healing time. Abdominal hysterectomy, the most common method, is used in cases such as after caesarean delivery, when the indication is cancer, when complications are expected or surgical exploration is required.